You already know that Harrison Ford improvised his gunshot in Raiders of the Lost Ark, but even if you’re an Indy fan, there are probably a few facts and stories you don’t know about the third installment of director Steven Spielberg and producer George Lucas’s collaborative adventure series. 1. SPIELBERG MADE LAST CRUSADE TO APOLOGIZE FOR TEMPLE OF DOOM. After the masterpiece of spirited adventure that was Raiders of the Lost Ark, some critics and audience members felt betrayed by the grim and gruesome sequel, Indiana Jones and the Temple of Doom. Director Steven Spielberg was hardly a defender of the movie—in 1989 he admitted, “I wasn't happy with the second film at all. It was too dark, too subterranean, and much too horrific. I thought it out-poltered Poltergeist. There's not an ounce of my own personal feeling in Temple of Doom." Spielberg’s involvement in a third Indiana Jones film sprang from his desire to apologize to viewers for the series’ disappointing second outing, and to revive the earnest spirit of the original. He rehired supporting stars Denholm Elliott and John Rhys-Davies to double down on the Raiders ambiance. 2. EARLY DRAFTS OF THE SCREENPLAY FEATURED A SCOTTISH GHOST. Before settling on its father-son mission to retrieve the Holy Grail, Spielberg and Indiana Jones creator George Lucas entertained a number of potential plots. Lucas proposed the idea of Indy facing off against a ghost in Scotland while bound for the discovery of the Fountain of Youth. He dubbed the story Indiana Jones and the Monkey King. 3. THERE WERE ALSO MAGICAL PEACHES. Spielberg brought in screenwriter Chris Columbus, with whom he had previously collaborated on The Goonies. In his first go at the script, Columbus fleshed out Lucas’s Scottish ghost idea (developing the character as the late Baron Seamus Seagrove III) but replaced the Fountain of Youth with the Peaches of Immortality, a construct of Chinese mythology. Also present in Columbus’ first draft were a 200-year-old pygmy, a cannibalistic African tribe, and a college student named Betsy whose love for Dr. Jones tests the limits of sanity. 4. THERE WAS A DEADLY CHESS GAME, TOO. 5. INDY ALMOST HAD A NUN AS A LOVE INTEREST. Spielberg replaced Columbus with The Color Purple screenwriter Menno Meyjes, who introduced elements that would ultimately reach the screen in The Last Crusade, such as the Holy Grail and the character of Henry Jones Sr. Meyjes’s script concluded with Indy’s father rising to heaven upon discovery of the Grail and Indy himself marrying a former nun named Chantal. 6. SPIELBERG WAS AFRAID THE MOVIE WOULD REMIND PEOPLE OF MONTY PYTHON. 7. A RENOWNED PLAYWRIGHT SECRETLY PENNED THE INDY/HENRY MATERIAL. 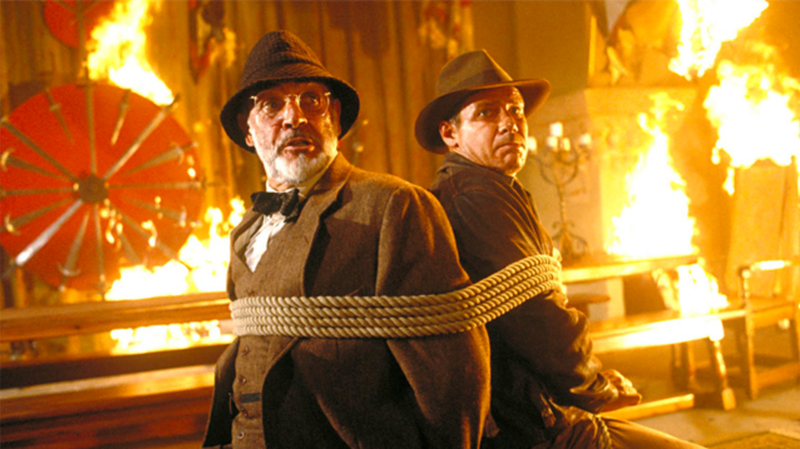 Since the relationship between Indy and his estranged father, played by Sean Connery, provided the emotional meat of the story, Spielberg and Lucas hired a ghostwriter to bolster the gravity of the characters’ interactions. Celebrated playwright Tom Stoppard contributed the bulk of the Jones boys’ material but didn’t receive a writing credit. 8. FORD AND CONNERY TOOK OFF THEIR PANTS WHILE SHOOTING ONE SCENE. 9. THE MOVIE HELPED TO PIONEER THE RAT INSURANCE GAME. Finally, there was the unprecedented matter of taking out an insurance policy on the unpredictable creatures. After some negotiation, the Fireman’s Fund Insurance Company did indeed grant Paramount Pictures the very first (and more than likely last) “thousand-rat insurance policy.” The policy would have paid off if the production had lost more than 1,000 of its rodents. 10. THE SOUND DEPARTMENT USED HOUSEHOLD ITEMS TO MIMIC THE NOISES OF DESTRUCTION. To produce the sound of raging fire for the sequence in which Indy and Henry escape from the burning German castle, the sound team digitally modified the sound of friction against a Styrofoam cup. The rubbing of a balloon doubled as the sound of earthquake tremors in the film’s climax. The rapid degradation of Julian Glover’s villainous character Walter Donovan following a sip from a particularly unholy grail (“He chose poorly”) is considered the first complete digital composite shot in Hollywood history. Glover was filmed in several separate stages of the sped-up aging process, which were digitally melded together (along with shots of puppet heads for some of the later stages) and translated back to film as one cohesive take. 12. SPIELBERG BEFRIENDED THE KING AND QUEEN OF JORDAN DURING PRODUCTION. Much of Last Crusade was shot in Petra, Jordan, during the reign of King Hussein bin Talal and Queen Noor. The royal family was invited to the set to observe production, and in turn developed a rapport with Spielberg. The king actually loaned Paramount the four horses seen in the final sequence of Last Crusade, and the queen occasionally gave Spielberg a ride to shooting locations. 13. THE LAST CRUSADE DID WONDERS FOR PETRA’S TOURIST DRAW. After the release of the movie, international interest in Petra skyrocketed. Prior to the film, the city saw only a few thousand visitors every year. That number reached into the millions following Last Crusade’s release. 14. HARRISON FORD ISN’T THE ONLY ACTOR TO APPEAR IN ALL THREE ORIGINAL INDY FILMS. The sequel brought back the familiar faces of Denholm Elliott and John Rhys-Davis, but it also welcomed a less recognizable returning player to the action: Pat Roach, who doubled as a Sherpa and a mechanic in Raiders of the Lost Ark, played a guard in Temple of Doom, and made his final Indy appearance as a Gestapo officer in Last Crusade. Other than Ford, Roach is the only actor to appear in all three movies. He passed away in 2004 before shooting on Indiana Jones and the Kingdom of the Crystal Skull had begun. 15. THE FILM’S OPENING NEARLY BROKE A RECORD. Indiana Jones and the Last Crusade grossed $5.6 million on the Wednesday it opened, the second-largest box office draw ever for a midweek opening before Memorial Day. The only thing that topped it was the 1984 opening of Return of the Jedi, which pulled in $6.2 million. The film went on to gross over $197 million against a production budget of $48 million.